Saturday was a busy day for North Ayrshire Ice Hockey Club with 4 of our 6 teams in action. 1st up were our Stars who travelled to Ayr to take on Ayr Bruins (U14’s) in an afternoon game. 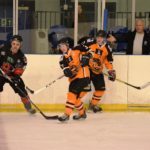 With all players back in action for the Stars and a number of our training up 12’s, Ayr Ice rink was a sea of orange and white. The game started fast with the play moving from end to end until Stars made the breakthrough, the opening goal coming from Flynn Massie assisted by Liam Houston at 3.32 mins, this wsas followed up less than 2 minutes later by another from Josh Carslaw assisted by Dylan Murray, who then went on to score 5 mins later assisten by Cole McMurdie. Unfortunately after an interference call, the Stars found themselves shorthanded, but Captain Jack Neil kept his team strong with a breakaway goal to bring the Stars 4 – 0 leaders at the end of the 1st period. 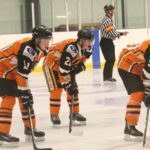 The 2nd period continued on with Ayr fighting back, taking the puck to our goalie Calum Simmonds but being denied every time, it was Cole McMurdie who made it past the Bruins goalie after 1.5 mins with an unassisted goal, quickly followed by another from Captain Jack, this time assisted by Dylan Murray & Conar Miller, With Bruins feeling the pressure they then recieved a couple of tripping calls leaving them shorthanded to which Jacob Woods took full advantage and scored with the assist coming from Cole, this was then followed up by a goal from Dylan Murray assisted by Jack and Fraser Maloney meaning Stars finished 2nd period 8 – 0. 3rd period was as fast paced with Bruins not giving an inch but the Stars were as equally determined to carry on where they had left off with a goalie change seeing Caiden MacColl making his 1st appreance in goals for the Stars his team didn’t disappoint with another 5 goals coming in from Dylan Murray, Jack Neil, Travis Baillie & 2 from Aaron Stewart with assists from Jacob, Cole, Flynn, Liam, Dylan Simpson & Adam Bainbridge before Bruins managed to claw a goal back 2 minutes before the end. Stars were easy winners with the game finishing Stars 13 – 1 Bruins with our Man of the Match going to Conor Wood. 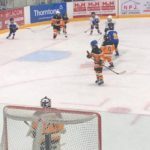 With every player from goalies, defenders to forwards contributed to this win and with goals coming in from across the team shows just how strong they are bonding and growing together. next up were the Predators who also travelled to Ayr to face the Bruins (U16’s) with a 5pm face off. 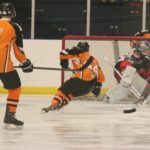 This game got off to a flying start with the Predators scoring after just a minute and continued that way in each period and although both teams took a number of penalty minutes, it was to be another win for North Ayrshire and the Predators. Meanwhile our youngest team, Sabres & Learn to play travelled through to Dundee to take part in more x-ice games. The LTP played well against some very good teams including Lanarkshire, 2 teams each from Dundee, Murrayfield & Fife and are gelling great, growing in skills and confidence with every passing week. These x-ice matches help the kids with their sense of space and player awareness, letting them practice the skills they have learnt at their training sessions. Our goalies Jake Reilly & Kyle Wedegren showed the spirit of hockey by helping other teams that didn’t have a goalie. Well Done to all our players, Keep up all that good work. Our only home game this week saw The Wild (SNL) v Murrayfield Racers in the return leg of the Scottish Cup. 1st period started with the Wild coming off the bench with a mission and went 1 up with 1.44 minute on the clock, but the racers fought back & after 10 mins equalised, then with a further goal 14 mins on the clock, The period finished 1-2 to the Racers. 2nd period was a tight period with both teams displaying a good quality of hockey, the Wild had a few breakaways but Racers Net Minder Mark McGill was not letting anything past him. At the end of the 2nd period wild were 3-1 down. 3rd period proved, as we all know, from over the last few weeks are the Wild’s strongest period but it was not to be. 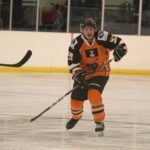 With repeated penalties seeing Wild down to 3 men in some cases, the game displayed good quality hockey with Wild playing probably the better hockey upfront but could just not take the chances and against a team at this level. The game ended with 6-1 to the Racers. Man of the Match: Lewis Davidson. Today is Scotland National Trails Day. We are delighted to have 16 boys heading through to Dundee for the 2nd day of trials to earn their place in the national squad. Congratulations to Under 11’s – Rocco Murray, Lennon Deeney & Caiden MacColl. Under 13’s – Liam Houston, Flynn Massie, Adam Bainbridge & Jacob Woods. Under 15’s – Harry Campbell, Jack Neil, Cole McMurdie, Dylan Simpson & Josh Carslaw. Under 17’s – Zak Kenneth, Hayden Woods & Callum Lymburn. To have been put forward is a great achievement and shows that you have worked your socks off and it’s been noticed, now is your chance to show the Scotland coaches just how good you are. We also have 3 girls heading to Lanarkshire to take part in Scotland Girls development training. Good Luck to Emma Lamberton, Emma Miller and Connie McDonald. We have 2 home games. The Penguins and Stars welcome Belfast U12 & U14 to Auchenharvie Ice Rink. Face off 6pm and 7.30pm. Come along and see these amazing teams in action. 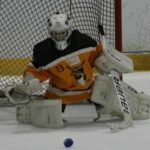 Jake Reilly (Goalie) from Sabres X-Ice, Photo Credit: Fiona Blacklock & Laura Kennedy.